The Isley Brothers have been cited as having enjoyed one of the longest, most influential and most diverse careers in the pantheon of popular music. 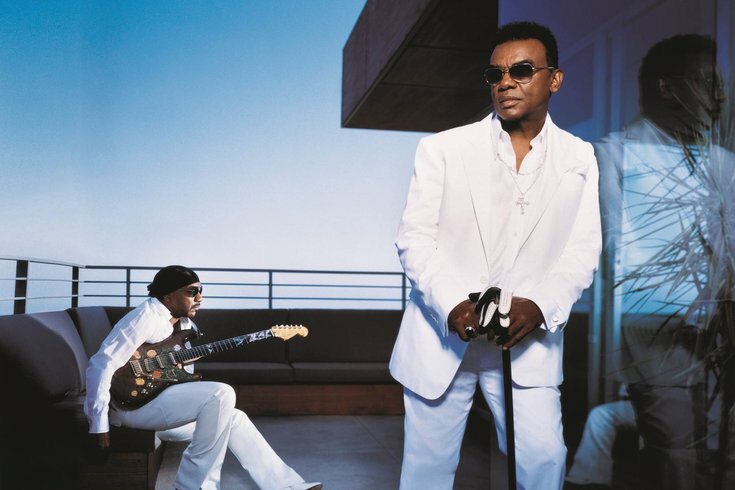 There are two things that always occur when Ernie and Ronald Isley – the world-famous, soul-spinning Isley Brothers – get into a room together, be it a recording studio, a live concert venue or a dining space. First, the whole shebang is going to be funky, period. Whether it’s early hits like 1959’s “Shout;” their end-of-the-'60s brand of psychedelic shack soul (e.g. “It’s Your Thing”); their stomping, satin-laced '70s sound (“Harvest for the World”); or the salty, smooth R&B of the '90s and 2000s (R. Kelly-produced tracks like “Lay with You”), the Isleys are on. Check them out at The Borgata in Atlantic City this weekend, and you’ll see and hear how righteously funky they can be. Then there’s the fact that guitar-playing baby brother Ernie and elder singing sibling Ronald (the latter, one of the Isley Brothers’ original trio) are tight. “We have each other’s back always, whether it’s on stage or on the home front,” Ernie Isley said. That feeling of real family is magnified when you consider that the Isley Brothers’ newest album, 2017’s “Power of Peace,“ was recorded with hardly any rehearsals at all and in collaboration with legendary guitarist Carlos Santana and his wife, drummer Cindy Blackman Santana. Joining in on the spiritually uplifting record is the O’Jays’ Eddie Levert (father of the late, great singer Gerald Levert) and there's a backing chorus of Kandy and Tracy Isley. “Ronald and Carlos discussed the tunes they wanted to do before we got in the studio,” Ernie Isley said. Making new music is a must for the 60-year-old ensemble of brothers. It keeps them fresh and puts them in a league that not many legacy rockers or R&B acts can or will do. ”I can’t speak to any other artists and the ebb and flow of their career, but my brother and I won’t be confined to any preconceived categories, style or legacy,” Ernie Isley said. “We like making new music and that’s allowed us to change with the times. Even when you recall that Aaliyah, Ice Cube, Bone Thugs-N-Harmony and Notorious B.I.G. have sampled our music, we’re in the moment,” the younger Isley said. The present and the future are cool, but Ernie Isley is always keen to discuss the Brothers’ illustrious past. Ernie fondly recalls being 11 years old in 1963 and the Brothers hiring a young Jimi Hendrix. “He was 10 years my senior,” Ernie Isley recalled. “When he came into our house, our family bought Jimi his first Fender guitar,” Ernie said with a laugh. Then there’s Ernie’s first live gig, which he recalls happening in 1966: playing drums for his brothers at Philly’s now-defunct State Theatre at South 52nd Street – with Martha & the Vandellas and Frankie Lymon on the bill. The Isley Brothers, with special guest Aaron Neville, appear Friday, Oct. 20, at the Borgata Event Center, 1 Borgata Way, Atlantic City, N.J. Tickets are $69-$89. Showtime is 8 p.m.